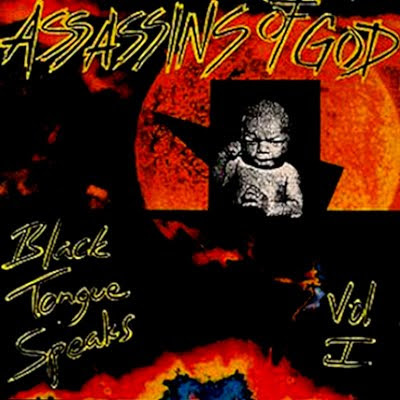 Assassins of God appeared suddenly out of nowhere, released three albums, & disappeared without really ever causing a great stir. They played the first Lolapalooza & toured Europe often.Of their three discs, Black Tongue Speaks, Vol I is without a doubt their masterpiece. It is characterized by a dark atmosphere on songs like “I am My Disease” & “The Hate Song”, also by restless, hysterical guitar & fantastic bass runs. There are walls of sound & noise that go on to develop into the most beautiful melodies & riffs. It is hard to explain their music & I’ve never heard another band like them. They were occasionally classified as “Jazzcore”. Personally I feel they don’t fit into any category. The members of AOG: Ken Kearney (guitar & vocals); Ellen Schoenwetter (bass); & Bruce Ducheneaux (drums) are part of the incestuous art/musick scene in San Francisco. Ken Kearney appears with the Mutants on Forensic Report. Lately Ken has been playing more straight ahead jazz backing Tracy Sirota & in his own Ken Kearney Quartet. Ken Kearney early on played in the Atones with Mark Weinstein of MX-80 Sound (& Amoeba Records owner). MX-80 Sound were one of those bands ahead of their time, influencing bands such as Sonic Youth, the Swans & Live Skull among others. MX-80 played rather dissonant, discordant heavy-rock. Their main influences seem to be Captain Beefheart & the Stooges, yet at times they seem more akin to Pere Ubu, Television, early Siouxsie & the Banshees, sometimes even managing to sound not unlike Joy Division. Mark Weinstein & Bruce Anderson of MX-80 Sound had a ensemble group Pluto that Ken Kearney played in along with Len Paterson & his wife Ellen Schoenwetter. About Pluto’s The Field Recordings, “There is no way to describe the music & lyrics on this LP. All the world loves a good, healthy search for a lost set of keys…” It's not exactly rock'n'roll & it's not exactly jazz. It's more like something Tom Waits might play while relaxing in the bath after a hard day banging brake drums (Pluto also features Ralph Carney [tenor saxophone, clarinet, trumpet] from the Tom Waits band). Len & Ellen play in the group Flowtilla (formerly The Len Paterson Trio) formed in 2000. Their driving sound is an eclectic mix of funk, afro, jazz & world tinged grooves. They released their first cd under the name Len Paterson Trio entitled Sunny Cloudy. They have released two more c.d.s as Flowtilla, 2003s Out of the Inside & 2006s Clariphonic. Drummer Bruce Ducheneaux also has an extreme musickal pedigree. He originally joined the band Bomb after they were dropped by Warner/Reprise & after original drummer Tony Flag quit. This gives him an early connection to Ken Kearney, as Jay Crawford of Bomb was recruited for the band Housecoat Project (circa 1986). Ken played guitar for the Housecoat Project on a west coast tour while Jay was on tour with Bomb. Bruce has drummed with Waycross, Cinnamon Girls, & The Primal Abyss as well as being an integral part of several Gary Floyd (of Dicks, Sister Double Happiness infamy) projects, namely The Gary Floyd Band & Black Kali Ma. Who are you and how did you find out all this stuff? Can't believe any one would know I did a couple tours w/ House Coat Project. You are one advanced detective! Nathan Nothin' here. I'm just a fan of musick, lived all of my adult life in the Bay Area (until moving to Sacramento several years ago). Thanks for the comment & if there are errors or things you think should be added, let me know. I do the best I can. Might be one advanced detective, but don't know how to drop you a line. You can drop me a line at dumpbush@outgun.com if you want. I'll definitely keep your e-mail address private. Hubert Napiorski from Poland here. I am so happy that I found this website, I was a huge fan of AOG back in the 90's and attended all their concerts in POland. I still have all their albums on cassettes released by QQRQ productions. I'm trying to catch up on all the albums you posted while I was away. This one seems particularly interesting. Thanks for the introduction. thanks for the assasins of god post i seen these guys in seattle at what was once the ok hotel by the waterfront. i am just curious if you know anything about a band called neuroshima they were from the seattle area and the lead man was a guy named cully ewing i think he has something to do with lighting for the NW rave scene. just curious i cannot find anything on the web but i have a cassette. AOG is still one of my favourite bands, I just ripped a tape called "on the beach - live in gdynia 09-27-1992" sound is quite good so enjoy!